The Ubee Ambit DDW366 is the upgraded version of the Ubee DDW365. 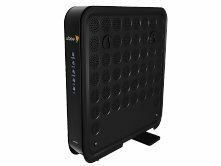 This model features a dual band wireless N router for a total of 900mbps bandwidth (2 x 450mbps) to go along with 343mbps modem speeds. We can't really recommend this model due to is spotty wifi coverage and outdated wireless N band. Only go with this if your internet speeds are less than 25mbps.